Lama Ole Nydahl is a Buddhist teacher in the tradition of the Karma Kagyu lineage, and founder of over 650 Buddhist centers worldwide. On their honeymoon in 1968, Lama Ole and his wife Hannah met the 16th Gyalwa Karmapa, head of the Karma Kagyu lineage of Tibetan Buddhism. The 16th Karmapa asked them to teach Diamond Way Buddhism and meditation in the West, and to found Buddhist centers. 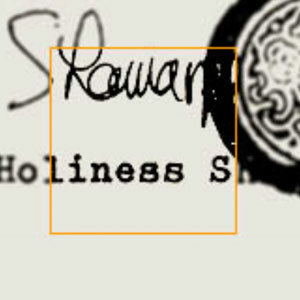 Since then, he has travelled the world giving lectures, leading meditation courses and guiding Buddhist centers. 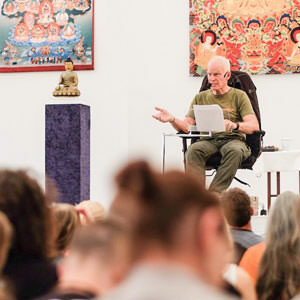 Lama Ole Nydahl has founded more than 650 Buddhist centers of the Karma Kagyu lineage, and is one of the best known western Buddhist teachers, and through his activity the Karma Kagyu lineage is one of the most popular Buddhist traditions in the West. If you'd like to learn more about Buddhism, here is an introduction. 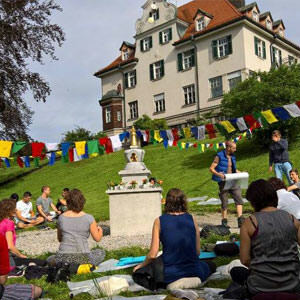 Lama Ole Nydahl strongly encourages international connections between his students. The Europe Center is the meeting place for this exchange. Every summer thousands of students attend from 60 countries. The award-winning film about Hannah Nydahl tells a true story of Buddhism coming to the West.